Nikon D3100 with the Nikon 18-55mm zoom lens. AF-A (Auto-servo AF); AF-S (Single-servo AF); AF-C (Continuous-servo AF); MF (Manual focus). Auto modes (auto, auto [flash off]), Guide Mode, Advanced Scene Modes (Portrait, Landscape, Sports, Close-up, Night Portrait), programmed auto with flexible program (P), shutter-priority auto (S), aperture-priority auto (A), manual (M), (Q) quiet mode. 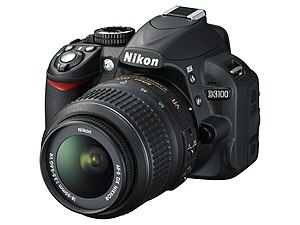 The Nikon D3100 is a 14.2-megapixel DX format DSLR Nikon F-mount camera announced by Nikon on August 19, 2010. It replaced the D3000 as Nikon's entry level DSLR. It introduced Nikon's new EXPEED 2 image processor and was the first Nikon DSLR featuring full high-definition video recording with full-time autofocus and H.264 compression, instead of Motion JPEG compression. It was also the first Nikon DSLR to provide high-definition video recording at more than one frame rate. Use is assisted by two Guide Modes: Easy Operation and Advanced Operation tutorial. On April 19, 2012, the D3200 superseded the D3100 as Nikon's entry-level DSLR. Nikon's 14.2-megapixel Nikon DX format CMOS sensor with 12 Bit Resolution. Nikon EXPEED 2 image processor. Sensor cleaning and airflow control system. Continuous Drive up to 3 frames per second. Full-time autofocus in movie mode. 3D Color Matrix Metering II with Scene Recognition System. 3D Tracking Multi-CAM 1000 autofocus sensor module with 11 AF points. ISO sensitivity 100 to 3200 (6400 and 12800 with boost). i-TTL flash exposure system without built-in, but support for external wireless flash commander. Like Nikon's other consumer-level DSLRs, the D3100 has no in-body autofocus motor, and fully automatic autofocus requires one of the currently 162 lenses with an integrated autofocus-motor. With any other lens, the camera's electronic rangefinder can be used to manually adjust focus. Can mount unmodified A-lenses (also called Non-AI, Pre-AI or F-type) with support of the electronic rangefinder and without metering. Nikon GP-1 GPS Unit for direct GPS geotagging. Third party solutions partly with 3-axis compass, data-logger, bluetooth and support for indoor use are available from Solmeta, Dawn, Easytag, Foolography, Gisteq and Phottix. See comparisons/reviews. Battery grip third party solutions are available. Third party solutions for WLAN transmitter are available. Various Nikon Speedlight or third party flash units including devices with Nikon Creative Lighting System wireless flash commander or support for SU-800 Wireless Speedlight Commander. Third party radio (wireless) flash control triggers are partly supporting i-TTL, but do not support the Nikon Creative Lighting System (CLS). See reviews. Common Optional Lens: AF-S DX NIKKOR 18-55mm f/3.5-5.6G VR, AF-S DX NIKKOR 18-105mm f/3.5-5.6G ED VR, AF NIKKOR 50mm f/1.8D. Note: Lenses without an internal autofocus motor can only use manual focus on the Nikon D3100. Other accessories from Nikon and third parties, include protective cases and bags, eyepiece adapters and correction lenses, and underwater housings. The D3100 has received many independent reviews and image comparisons at all ISO speeds. The D3100 is the only known Nikon DSLR with an image sensor interface integrating analog-to-digital converters not made by Nikon: The result is a dynamic range only at the level of competitors like the (higher priced) Canon EOS 600D; lower than other current Nikon DSLRs. ^ "Nikon D3100". Digital SLR Cameras products line-up. Nikon Corporation. ^ Winans, Moose. "Nikon D3100 Focus Modes and Focus Points", CameraTips.com. Retrieved on August 16, 2013. ^ Laing, Gordon (November 2010). "Nikon D3100 Movie Mode". Nikon D3100 Review. CameraLabs.com. Retrieved February 6, 2012. Previous Nikon DSLRs offered a best quality movie mode of 720p at 24fps, but now the D3100 offers the same resolution at the choice of 24, 25 or 30fps, while crucially adding a new Full HD 1080p mode at 24fps. ^ "Nikon updates entry-level DSLR with 24MP D3200 and optional WiFi". Digital Photography Review. April 2012. Retrieved June 15, 2012. ^ "Specifications – Nikon D3100". Nikon Corporation. Retrieved 2010-08-19. ^ "Nikon D3000 Lens Compatibility". Nikon Corporation. Retrieved 2009-10-26. ^ Nikon D60 electronic rangefinder. Digital Photography Review. Retrieved on 7 September 2012. ^ "D3100 accessories". Nikon USA. Retrieved 2011-08-08. ^ "Nikon D3100". Digital Camera Views. Wikimedia Commons has media related to Nikon D3100 and Taken with Nikon D3100. This page was last edited on 19 February 2019, at 12:29 (UTC).